Perhaps quite predictable, but good news nonetheless for the prospects for raising another generation of Northern Harriers at Deer Lake was the arrival on the breeding territory of a female harrier just a couple of days after the male was scouting out the lay of of the land. 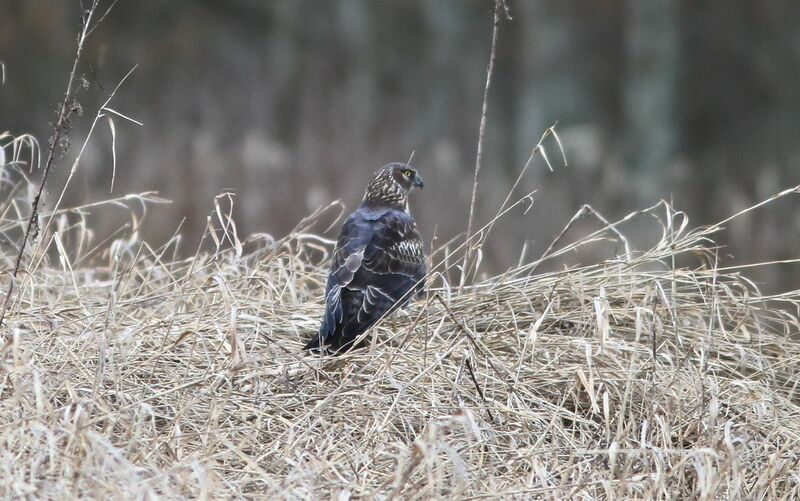 Female Northern Harrier newly arrived on her breeding territory. And of course we can anticipate the outcome of a male and a female on the breeding territory. The male was soon in courtship mode, and pursued the female whenever she landed on the meadow. Copulation was not captured photographically, but here the male is approaching the female very closely. In the meantime I’ll keep you posted as events unfold. Even better, get down to the meadows and check out the action for yourself. However, please keep out of the meadows and observe from the trails. The birds’ breeding success depends on us, and our dogs not disturbing them. 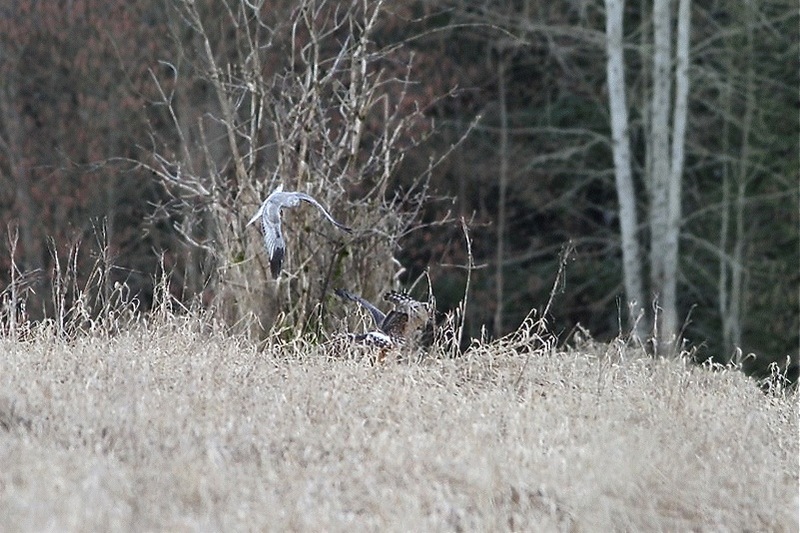 I’ve also updated the photographs with higher resolution images on the previous post about the harriers at Deer Lake. Click here to view that post and the upgraded images. Not only is the calendar telling us that today (March 20th) is Spring Equinox, but nature too is showing us the seasons are changing. The first Tree Swallows of the year showed up at Burnaby Lake just over three weeks ago, and there are all sorts of signs of spring in our parks. From the blooming of the indian plum in the forests, to the peeping of tree frogs down at Burnaby Lake, all confirm what the birds are telling us – spring is here. For me, one of the most exciting signs of spring is the return of the Northern Harriers to their nesting area in the meadows at the west end of Deer Lake. And just this past Friday (March 14) I saw the male harrier checking out his regular nesting area. 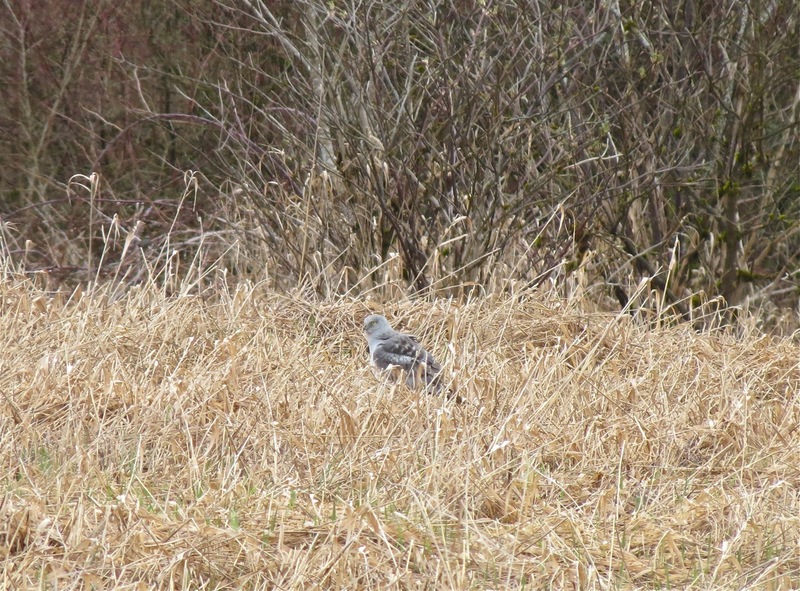 Not a great picture, but the bird was far out in the meadow. Below is a much better picture of the male harrier in flight. Jason Hung, who kindly let me use some of his photographs for this post (thank you, Jason), has much superior pictures of the birds than I can capture with my more basic camera gear. A lot of patience waiting for the birds to fly close-by is needed, and Jason’s patience and skill with a camera has certainly paid off. He’s managed to get some great shots over the past couple of years. 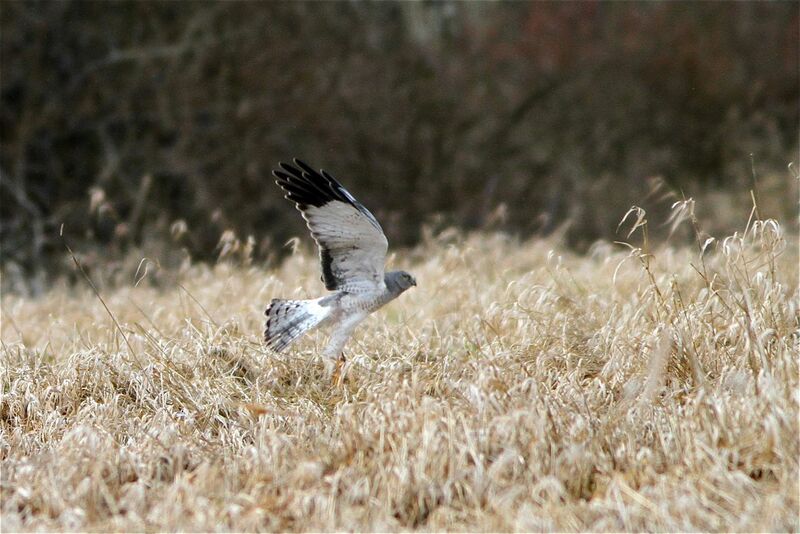 The fact that we’ve got harriers nesting at Deer Lake, is a real feather in the cap for Burnaby Parks – pun intended! We’re tremendously fortunate to have them nesting pretty much in the centre of the City because harriers need undisturbed wetlands or grasslands in which to nest and raise their young. Unlike many raptors, harriers nest on the ground, and as a result are very susceptible to disturbance from people and dogs. The Deer Lake birds arrived here about 10 years ago, and set up nesting territory in the park. 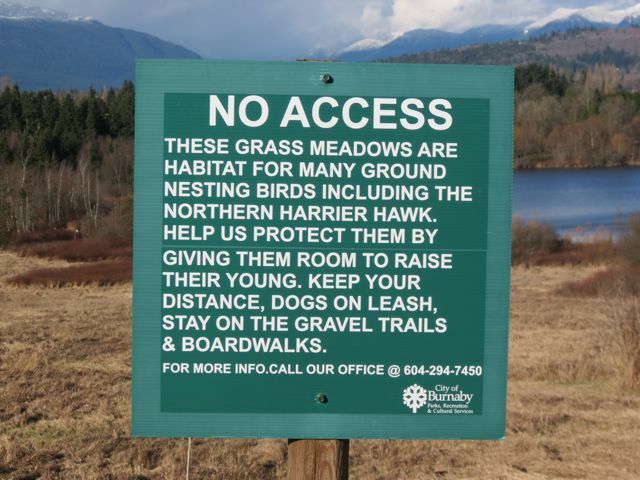 As the park has got busier over the years with the increasing population around Metrotown, the pressure on the birds’ habitat has increased. 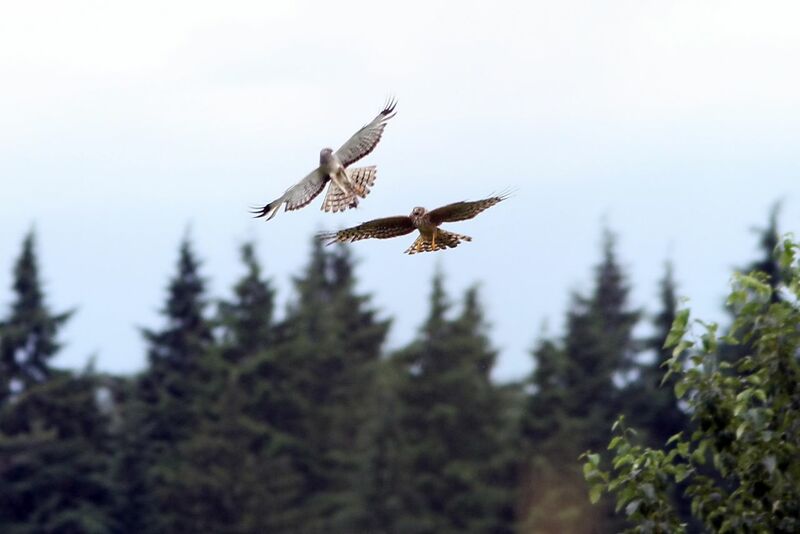 At least once in the past few years, a dog killed a young harrier on the ground, but in most years the pair has successfully raised one or two young. This city sign is important protection for our ground-nesting Northern Harriers. Let’s watch and enjoy them from the nearby trails. Now known as Northern Harriers, these birds were previously named Marsh Hawks and many readers may know them by the previous moniker. 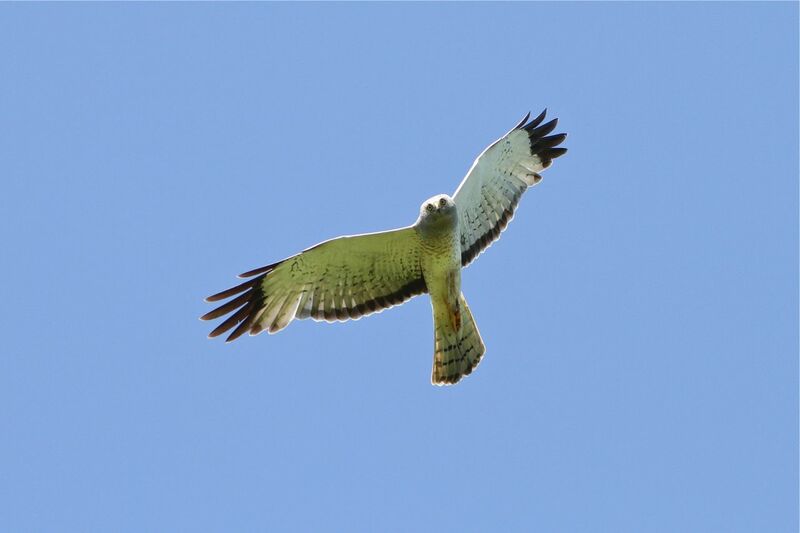 “Hawk” is a generic name applied to many raptors, but in the case of harriers it’s not a particularly apt descriptor.Compared to other North American raptors, harriers have a number of unique characteristics. Firstly, the males and females have strikingly different plumage; they are sexually dimorphic. As can be seen from the photos above, the males are grey backed, and mostly white underneath with black wingtips. The females, in contrast to the males, are mostly shades of brown above with buffy, streaked undersides. Looking at the picture above, it’s possible to see that harriers have another interesting feature not found in other day-hunting raptors. They have facial disks like owls, which perform the same function for harriers as they do for the raptorial nightshift. 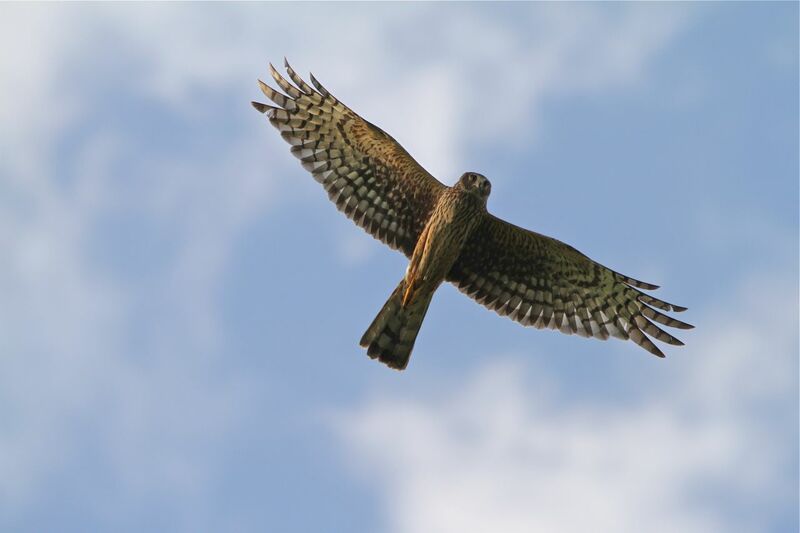 They focus the sounds of prey to enable the capture of mice and voles, even when they may be out of sight in thick grasses over which the harrier is gliding. Even more interesting, perhaps, is that the males are polygynous i.e. they mate with more than one female, sometimes up to five. However, mostly they are monogamous or bigamous, and in all cases the males provide most of the food for both females and the young. Our male at Deer Lake has typically had two females to provide food for. The second nest is in a virtually inaccessible part of the park, and while the patch of habitat is smaller, it may be more protected from intrusion because of its isolation. The provisioning of food for female and young by the male gives us the opportunity to see a very exciting and dramatic event. When the male returns to the incubating female sitting on the nest, he gives a whistling call, which is the signal for the female to get airborne. Once she’s up and flying she also calls insistently. 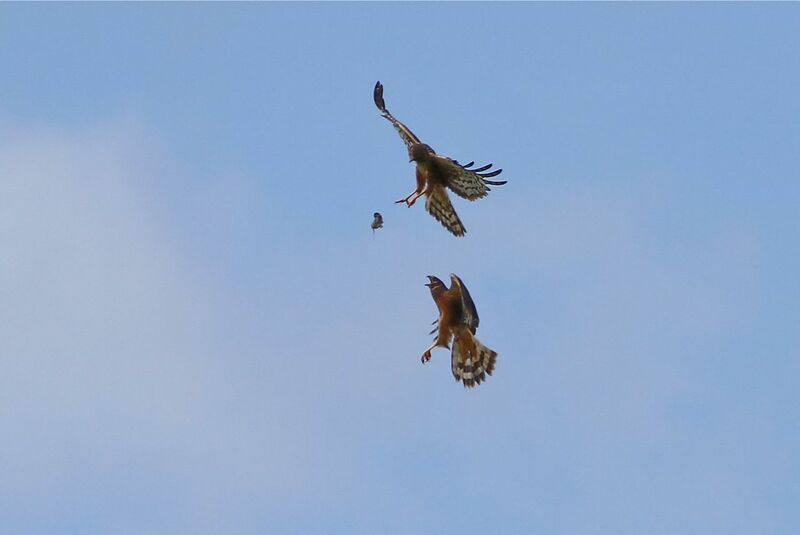 The male, flying higher, drops the prey for the female below to pursue and to catch in mid-air. It’s a wonderful aerobatic display. Male above, female below with prey just released by the male. When the young are flying, the adults will drop in prey for the young to catch in mid-air. Below, Jason once again captured the action. This time it’s the female making the aerial exchange with one of her young. Female to young prey exchange. The in-transit food is probably a Townsend’s vole. The next couple of months will provide many opportunities to observe the comings and goings of the Northern Harriers at Deer Lake. Keep your distance, and enjoy the show. Nesting starts in earnest in the next couple of weeks. Spring is definitely here. 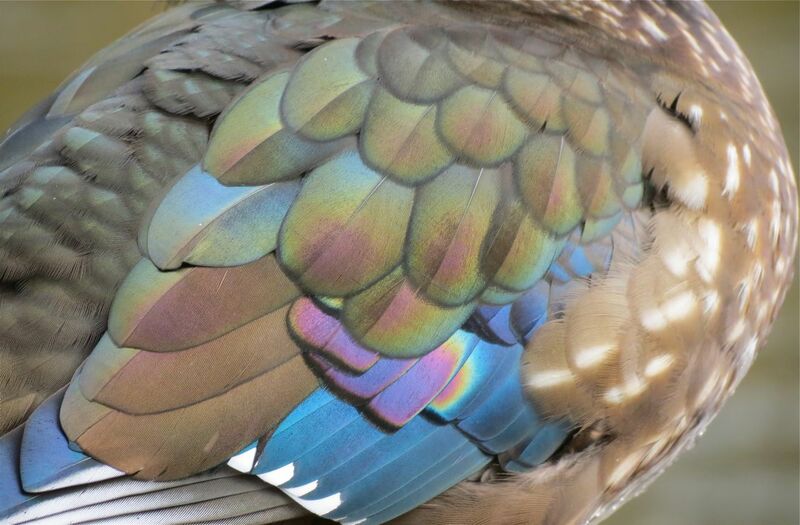 So let’s see: iridescent greens, blues, cobalt, purple, violet, bronze, ultramarine, crimson, burgundy spotted with white, black, and vermiculated gold; we could just as well be reading a list of exotic colours on an artist’s palette as descriptions of Wood Duck plumage – a dandy’s colours for sure. See for yourself; click on the image below. The females above are noticeably subdued in their plumage compared to the drakes, but being the sole incubator of the eggs, and the guardian of the young when they first emerge from the nest, it makes sense to be less eye-catching to predators. It’s all about remaining inconspicuous, and not drawing unwanted attention. This is a common evolutionary adaptation among many bird species, and among North American ducks nearly all species show this strong sexual dimorphism. 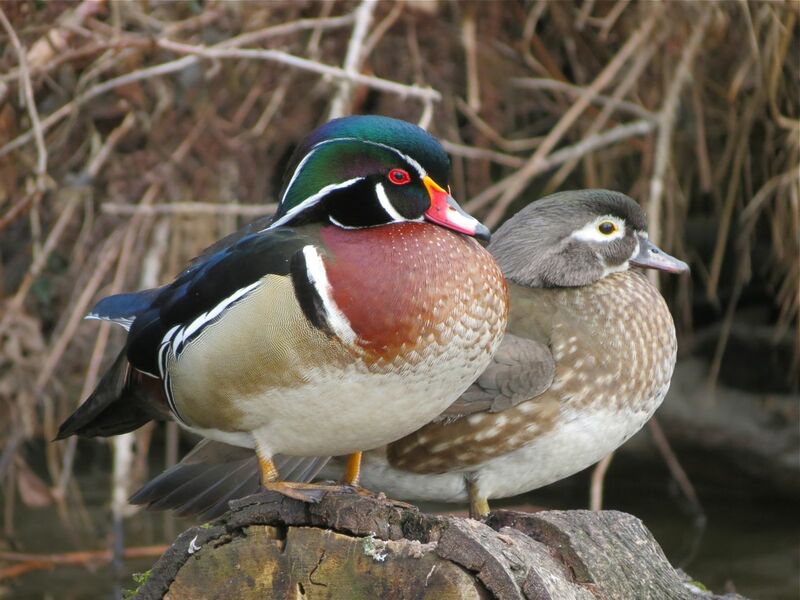 Wood Ducks happen to be one of the species that push these male/female differences to the extreme. While it is the drakes that catch the eye on a first look, both females and males are worthy of close scrutiny that reveals the real complexity and subtlety of the colours of both sexes. Let’s start with a closer look at the females. Female Wood Duck – showing the diagnostic white eye-patch that tapers to the rear. 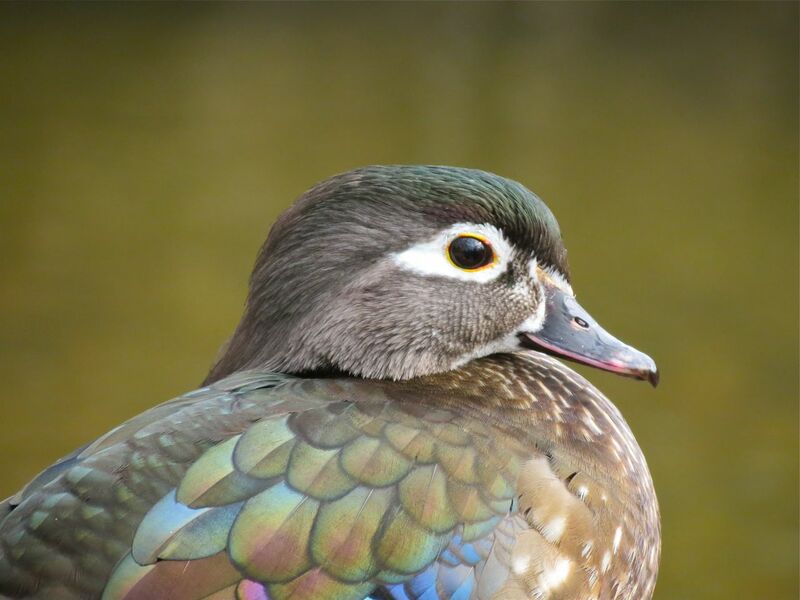 Most species of female ducks are relatively drab in colour, often a mixture of browns, buffs, and tans, but our Wood Duck above shows some iridescence both on the top of the head, and in the shoulder feathers (scapulars) spreading out below the neck. Taking an even closer look at the scapulars we see the subtle, but beautiful colours that we might otherwise miss when seeing a female perched alongside her fancier mate. Wood Ducks are unique among North American duck species. They are the sole representative on the continent of their genus, Aix (Greek for waterbird). In fact, the Aix genus contains only two species worldwide. The other is the Australasian Mandarin Duck – another contestant in the “dandy duck” stakes. Both are part of a larger group called the perching ducks. Wood Ducks certainly live up to that classification. They are often seen perching along the water’s edge on logs and in sometimes in trees. 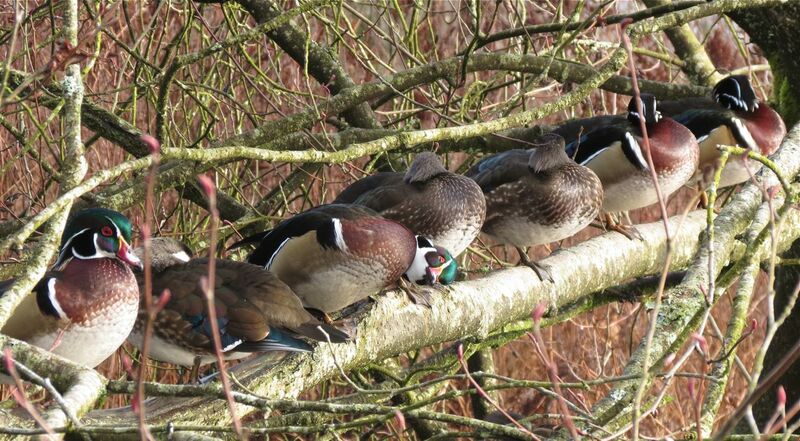 Confirming their scientific classification as perching ducks, Wood Ducks line a tree limb over Eagle Creek, loafing, preening and snoozing. There’s a certain irony, however, to the dramatic sexual dimorphism we see in Wood Ducks. It’s the drabber females’ choice of mates that drives the evolution of the spectacular male plumage. Pairs are seasonally monogamous, i.e. they pair-up anew each year, but because the males play no part in rearing the young (more “dandy” behaviour?) their breeding success is more strongly determined by their ability to attract a mate. Therefore, the bolder the plumage, which indicates to the female readiness and suitability of the male for breeding, the more chance the male has of being selected and passing on his genes to the next generation. Other species of birds in which the males do assist with rearing the young are frequently less sexually dimorphic. Here’s the drake Wood Duck. Wood Duck male – Dandy indeed! The colours above need no more description, but it is worth noticing the rakish crest that flows down the back of the head. 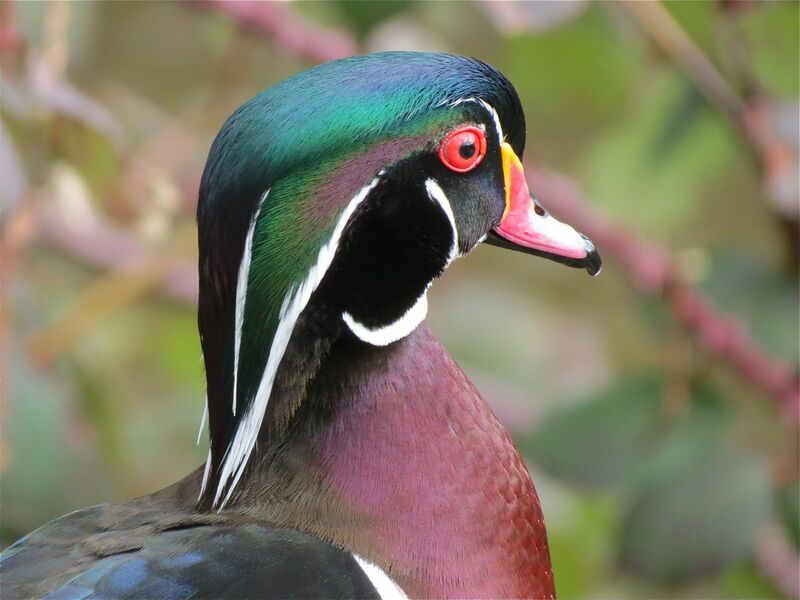 The female has one too, and among the dabbling ducks in North America (Mallards, wigeons, and teals etc), the crest sported by the Wood Duck is unique. This drake is perched next to a female, and is lifting his head to display to her the “full effect”. The gradations of colours here on the head are quite striking in close-up. No doubt they’re just what an interested female is looking for. 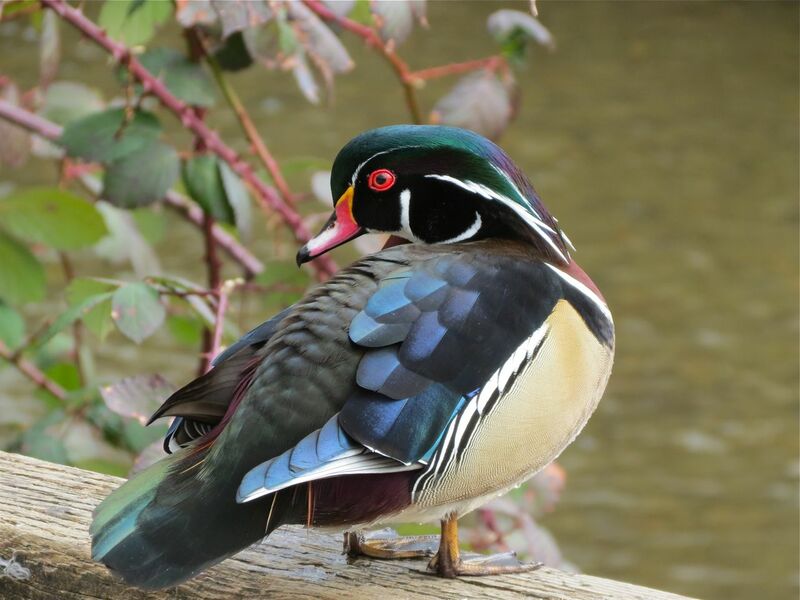 And while all this fantastic plumage is in pursuit of one thing – passing on the male’s genes to the next generation, Wood Ducks also need suitable habitat to breed successfully – marshy lakes and ponds with lots of surrounding vegetation. Oh yes, and one more thing; they need nest cavities. Before the forests of North America were extensively cleared, and the old trees that contained natural cavities from broken branches and abandoned woodpecker holes were cut down, Wood Ducks were numerous. However, by the late nineteenth century there were real fears that the Wood Duck would go extinct from the combination of habitat loss and over-hunting. After the Migratory Bird Act of 1918 ended the legal hunting of Wood Ducks, the species recovered rapidly. Concerned conservationists also helped them along by providing nest boxes to replace the natural cavities that had been lost in forest clearing. 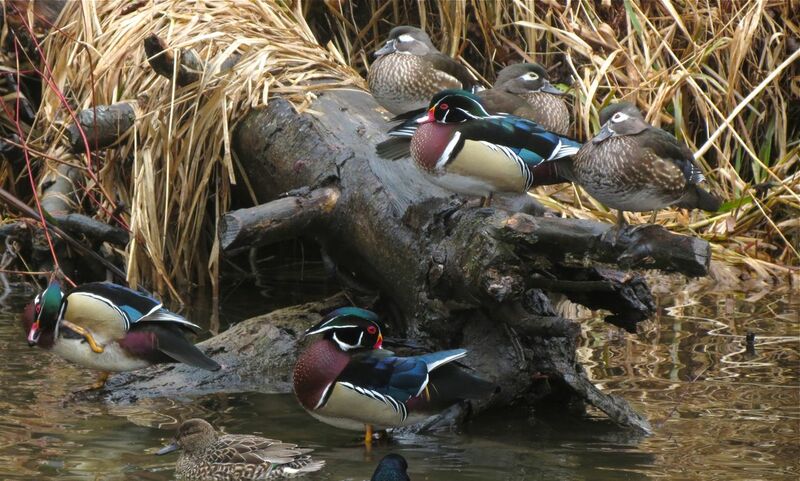 The best place locally to see lots of Wood Ducks is Burnaby Lake at Piper Spit, and it’s no coincidence that at this location you’ll also see many nest boxes put up specifically for Wood Ducks. 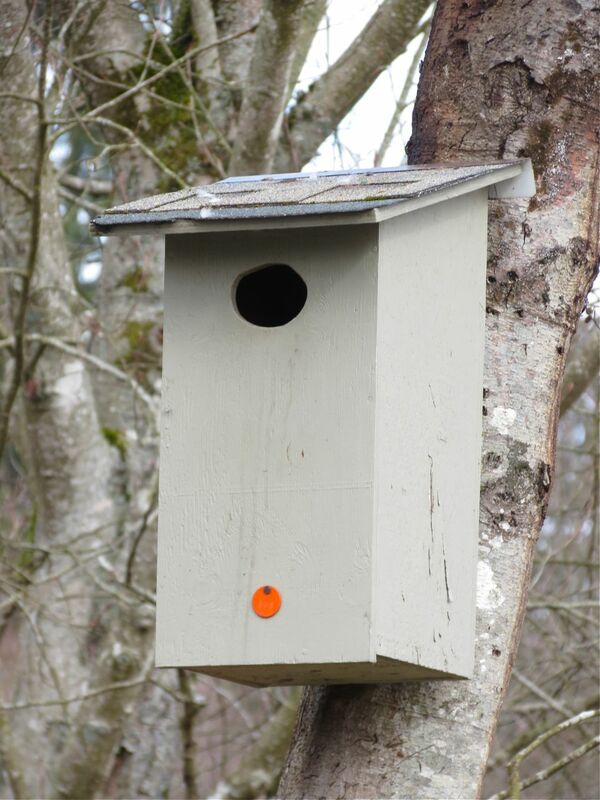 Although there are many nestboxes at Burnaby Lake, there may not be enough for all the ducks needing one. There are frequent incidents of egg-dumping here when more than one female lays her eggs in a single nest box – up to thirty eggs in a one box. Now not all the eggs will hatch in these conditions, but for a female that can’t find a nest cavity of her own, it seems a good strategy to ensure that at least some eggs produced by the female will hatch.